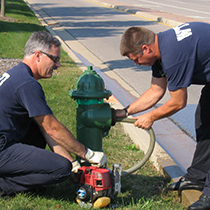 We will be conducting the annual fall pumping of Dublin’s 3,094 hydrants (with green bases) from September 13 through November 2nd, 2018. Flushing and pumping will take place daily, 8:00 a.m. – 6:00 p.m. Residents may experience brief and temporary periods of low water pressure or discoloration of water. If discoloration occurs, residents are advised to run cold water for several minutes until it clears. This should also be done prior to washing laundry to avoid stains on clothing. Hydrants with white bases are privately-owned. Owners of these hydrants are responsible for their flushing and pumping. Pumping prevents freezing, which can damage the hydrant, leaving it inoperable. Pumping is also necessary after every use during the winter months.